Just wanted to take a quick minute to express thoughts and prayers for anyone involved with the explosions in Boston. It’s been a sad week in America, and the death of a local police officer in Oklahoma City had already put a damper on our Monday. Chad Peery was paralyzed in 2011 after he tried to break up a bar fight and was brutally beaten. He has been honored in the community and at Oklahoma City Thunder games and was an inspiration to many. 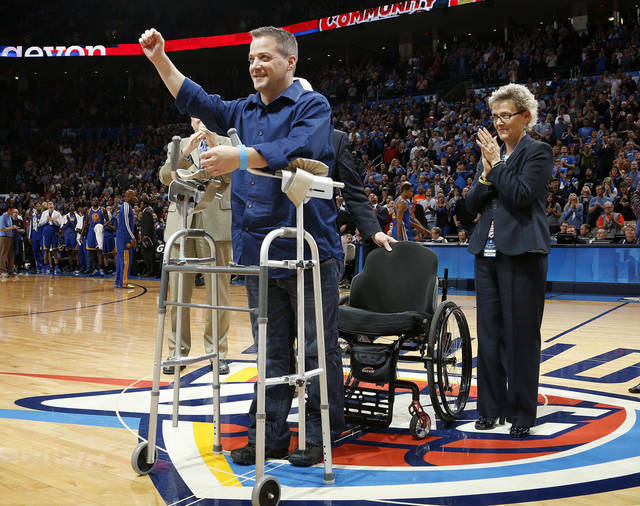 I attended a Thunder game where he was honored, and I didn’t know much of his story but I was truly touched. To maintain such a positive attitude through such a horrific tragedy is so inspirational and I know Peery will be remembered greatly by the Oklahoma City community. Later that day, we all heard of the explosions at the Boston Marathon. I feel like it’s always a state of confusion immediately when these kind of things happen. I saw a picture on Twitter, but “explosion” was used, not “bombing,” so I thought (and hoped) perhaps at first it could have been an accident, although my gut told me otherwise. When things like this happen in our county, I (as I’m sure many others) just wonder why. I can’t fathom what would give someone the thought to hurt so many innocent people, but I think it’s best that way. Events such as this, as well as 9/11, the OKC bombing and the Sandy Hook tragedy just to name a few, aren’t meant to be understood in my opinion. I’m thankful that I can’t wrap my mind around something like this, and my deepest thoughts and prayers are with victims, families and residents of Boston. I know from experience the effect this type of thing can have on a community, and I wish the best for everyone involved. I’m sure many have seen the quote from Mr. Rogers, and I think it’s important in times like this. Despite the evil in our world, the good still outweighs it.